The Yin Yang is the ancient Chinese symbol of balance. Diffuse your balancing essential oils on this diffuser necklace to remind yourself that there is light and dark, day and night, sun and moon but that everything will be okay. 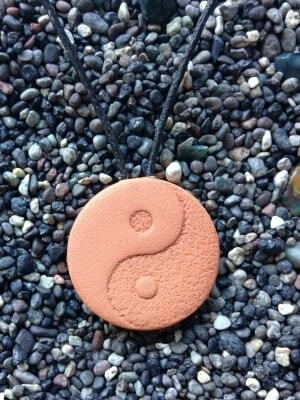 The Yin Yang Pendant measures 2.8 cm (1 1/8 in) across. Terra Cotta Pendant comes with a black waxed cotton, sliding-knot cord which can be adjusted in length to approximately 38 cm (15 inches) to 76 cm (30 inches) long. Also included is a short black stretchy cord witch can be used to convert the pendant into a Car Diffuser or a Hanging Ornament by switching the cords. Please Note: The cords are not interchangeable with this particular design.In order to convert this pendant into a Car Diffuser or a Hanging Ornament ; the long sliding-knot cord will have to be cut and replaced with the shorter black stretchy cord. Unfortunately this procedure will render the long waxed cotton cord unusable.